Everything should have a Type, enforced as much as is practical. Once learned, a concept should hold throughout all parts of sbt. With these principles in mind, let’s walk through the core design of sbt. This is the first piece you hit when starting sbt. sbt’s command engine is the means by which it processes user requests using the build state. The command engine is essentially a means of applying state transformations on the build state, to execute user requests. In sbt, commands are functions that take the current build state (sbt.State) and produce the next state. In other words, they are essentially functions of sbt.State => sbt.State. However, in reality, Commands are actually string processors which take some string input and act on it, returning the next build state. So, the entirety of sbt is driven off the sbt.State class. Since this class needs to be resilient in the face of custom code and plugins, it needs a mechanism to store the state from any potential client. In dynamic languages, this can be done directly on objects. A naive approach in Scala is to use a Map<String,Any>. However, this violates tenant #1: Everything should have a Type. So, sbt defines a new type of map called an AttributeMap. 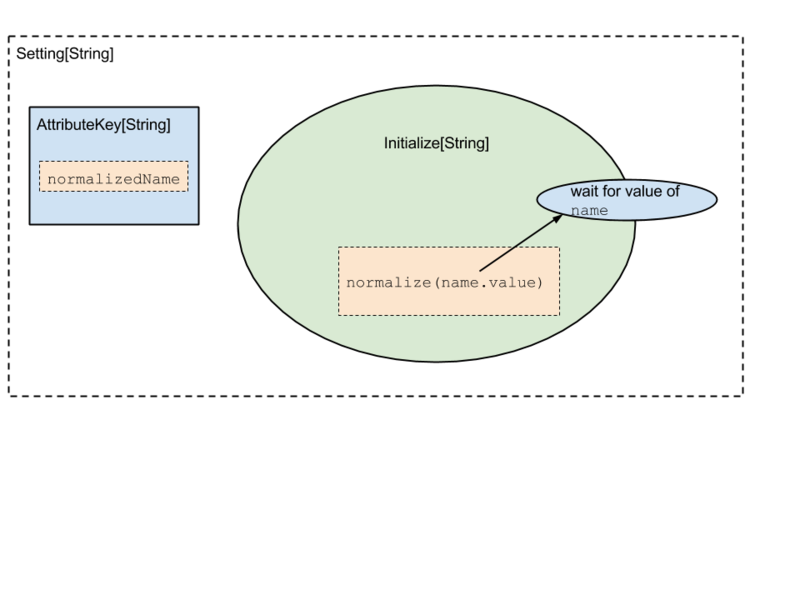 An AttributeMap is a key-value storage mechanism where keys are both strings and expected Types for their value. /** Gets the value of type ``T`` associated with the key ``k`` or ``None`` if no value is associated. /** Adds the mapping ``k -> value`` to this map, replacing any existing mapping for ``k``. Now that there’s a definition of what build state is, there needs to be a way to dynamically construct it. In sbt, this is done through the Setting[_] sequence. The AttributeKey[T] where the value of the setting should be assigned. An Initialize[T] object which is able to construct the value for this setting. sbt’s initialization time is basically just taking a sequence of these Setting[_] objects and running their initialization objects and then storing the value into the AttributeMap. This means overwriting an existing value at a key is as easy as appending a Setting[_] to the end of the sequence which does so. all associated Initialize[_] blocks for that key must have run before we load the value. Here, a Setting[_] is constructed that understands it depends on the value in the name AttributeKey. Its initialize block first grabs the value of the name key, then runs the function normalize on it to compute its value. This represents the core mechanism of how to construct sbt’s build state. Conceptually, at some point we have a graph of dependencies and initialization functions which we can use to construct the first build state. Once this is completed, we can then start to process user requests. The next layer in sbt is around these user requests, or tasks. When a user configures a build, they are defining a set of repeatable tasks that they can run on their project. Things like compile or test. These tasks also have a dependency graph, where e.g. the test task requires that compile has run before it can successfully execute. sbt defines a class Task[T]. The T type parameter represents the type of data returned by a task. Remember the tenets of sbt? “All things have types” and “Dependencies are explicit” both hold true for tasks. sbt promotes a style of task dependencies that is closer to functional programming: return data for your users rather than using shared mutable state. Most build tools communicate over the filesystem, and indeed by necessity sbt does some of this. However, for stable parallelization it is far better to keep tasks isolated on the filesystem and communicate directly through types. Similarly to how a Setting[_] stores both dependencies and an initialization function, a Task[_] stores both its Task[_]dependencies and its behavior (a function). TODO - Transition into Scope.